To meet your specific requirements Hotel Villa Boyana offers accommodation in a double room with separate beds. 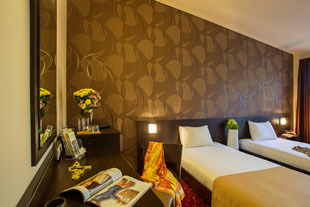 The room is spacious , with plenty of space , suitable for longer stays. The bathroom is stylishly appointed with modern and comfortable equipment. The colors in the room are soft, gentle , discreet red and burgundy accents. In furniture includes LCD TV , DVD and mini bar. Window frames with low emission and noise absorbing glass as thick curtain will separate from the rest of the world, and the hotel staff will take care to make your stay unforgettable. The room has a large balcony overlooking the city and mountains , where with pleasure can drink morning coffee. Everywhere have access to high speed internet.